Ethernet is by far the most commonly used LAN technology. Typically, a suite of application programs can be kept on the LAN server. Users can order printing and other services as needed through applications run on the LAN server. A user can share files with others at the LAN server; read and write access is maintained by a LAN administrator. 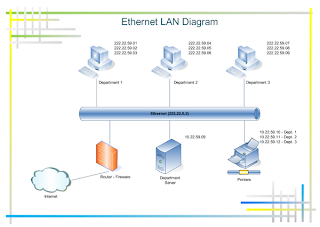 Ethernet is the most widely-installed local area network ( LAN) technology. An Ethernet LAN typically uses coaxial cable or special grades of twisted pair wires. 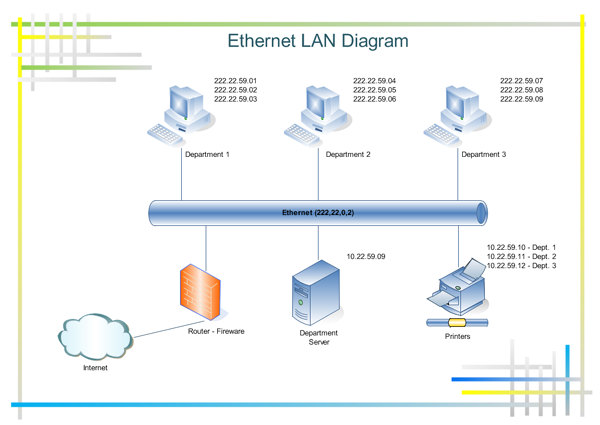 Ethernet is also used in wireless LANs. The most commonly installed Ethernet systems are called 10BASE-T and provide transmission speeds up to 10 Mbps. 10-Gigabit Ethernet provides up to 10 billion bits per second. The Token Ring protocol is the second most widely-used protocol on local area networks after Ethernet. The IBM Token Ring protocol led to a standard version, specified as IEEE 802.5. The Fiber Distributed-Data Interface (FDDI) also uses a Token Ring protocol. The FDDI protocol is based on the token ring protocol. An FDDI network contains two token rings, one for possible backup in case the primary ring fails. Work is underway to connect FDDI networks to the developing Synchronous Optical Network (SONET).